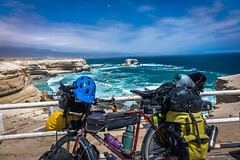 After spending a couple of days enjoying a small coastal town we headed South along the Pacific Coast of Chile toward the big city of Antofagasta. October 18, 2017 The route is along a paved road with a shoulder most of the way. There are undulating hills all day with an elevation no higher than 115 meters. The head wind was stronger later in the days. There are no town with stores or hotels along the route. Carry extra water. We wild camped. There was a hospedeje and stores 14km past where we stopped. The route includes nice ocean views all day. October 19, 2017 Again the route is on a paved highway with a shoulder. After cycling for 14km there are stores and then nothing until Mejillones. 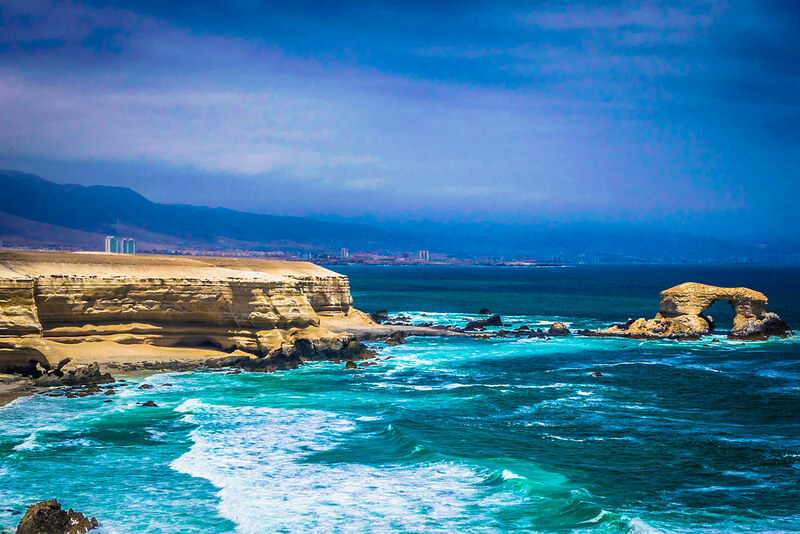 You can stay straight on the highway toward Antofagasta instead of turning right to head to Mejillones. There are lots of bus stops along the route with chairs. October 20, 2017 The route is along the same paved highway with a shoulder. Traffic is heavier as you are close to the city. After the airport we turned right to see the La Portada tourist site. It’s only 2km off the road and worth the trip. After returning to the highway there is a bike path off the highway the entire way into town. 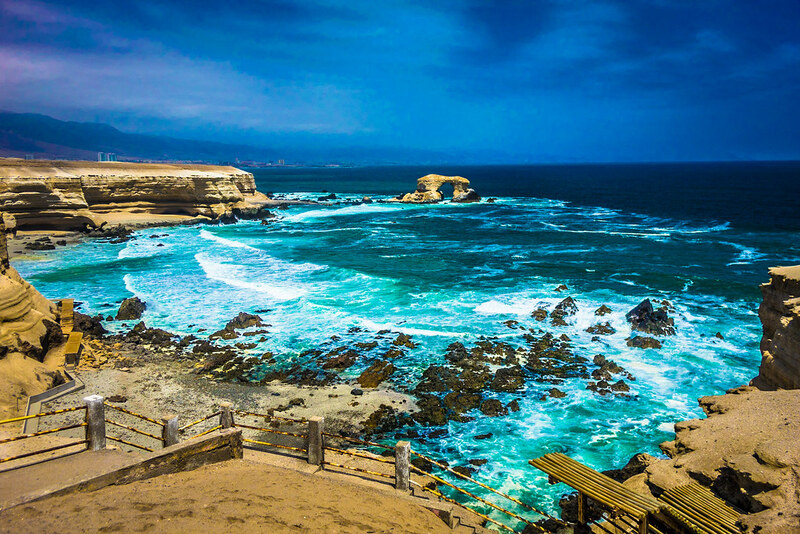 Antofagasta is a very large city with all the amenities you need. The first night we wild camped along the beach. There was a small town with a hospedeje 14km after where we stopped. The second night we stayed at hospedeje in Mejillones. There are lots to choose from. 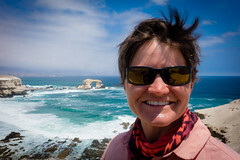 On the 3rd night in Antofagasta we stayed in a hospedeje we reserved on booking.com. There are dozens of hotels to choose from and we would not recommend where we stayed. 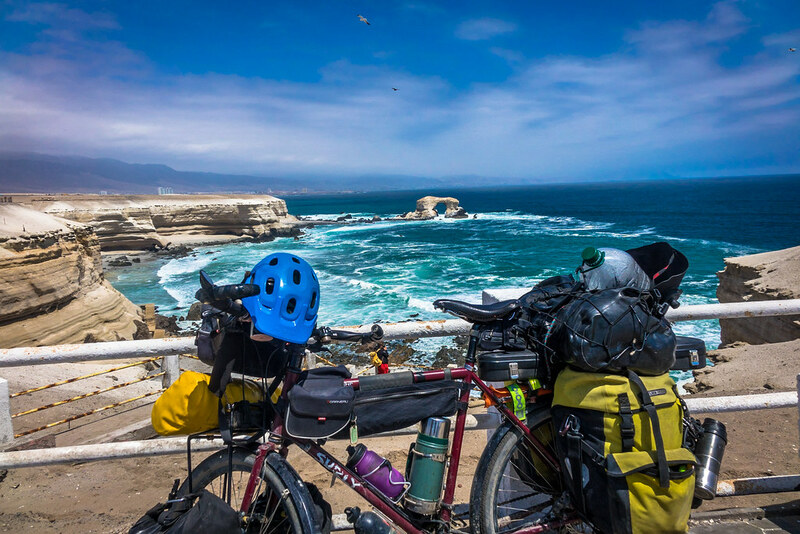 Andrew writes: After our stay in Tocopilla, we set off down the coast towards Antofagasta. It was a pretty barren stretch, with brown mountains on our left, and brown coastline on our right – punctuated every few dozen kilometres with a small camp/village. They all looked pretty worn down, with not a lot on offer. Good thing we had stocked up on supplies in Tocopilla. We pulled the plug just as the headwind picked up, so it’s a good thing that we started early today. 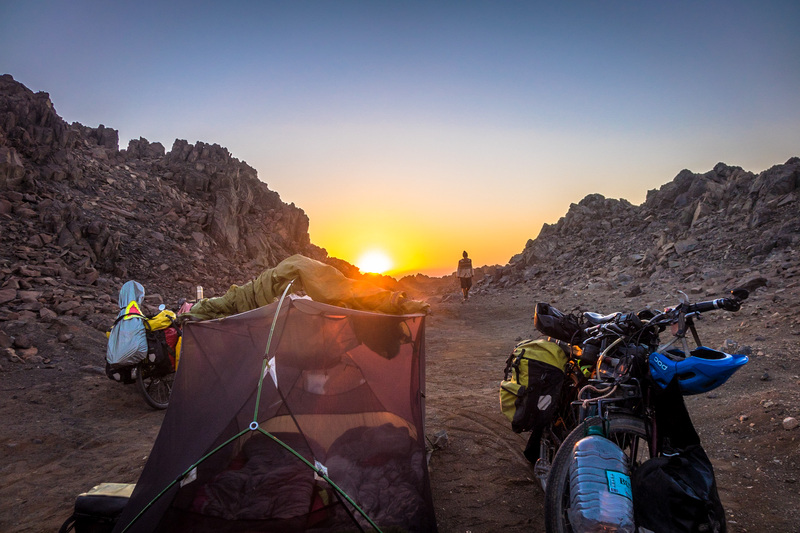 We still managed 65km before deciding to just find a wild camp behind some sand dunes. Except it was more like hoodoos, or rock dunes. They looked pretty neat, and we could tell from all of the car/truck tracks that it was a popular place to venture and camp. Finding water in the wild out here is impossible, which is why we made sure to fill up our 10L water bladder early in the day. Even then, it felt like we were having to conserve water in this arid environment. My favourite part of the day was trying to find a place to put our cell-phone so that it would get enough reception that we could listen to the Yankees/Astros baseball game. It ended up about 50 feet away from the camp on top of a rocky outcrop, then we used a bluetooth speaker to give us the audio. We did have one bad thing happen, it seems that with all of the dry air, our tent is giving up the ghost…the zipper is kinda screwy and won’t close properly on one side. Ahh well, without the fly on the tent, and with the dry air, it made for spectacular star-gazing. Again, the following day it was a relatively flat ride, which, because we started in the morning, was quite pleasant. We sort’ve ran out of time though, as when we made the turn for Mejillones, the wind machine turned on and we had to cycle the last 5km into the wind. Ugh. We cycled to the far end of town where we found a decent hospedaje (hotel). Mejillones was a neat little town. I especially enjoyed how the lady who ran the hostel where we were staying also sold ice cream. It made for a yummy visit! 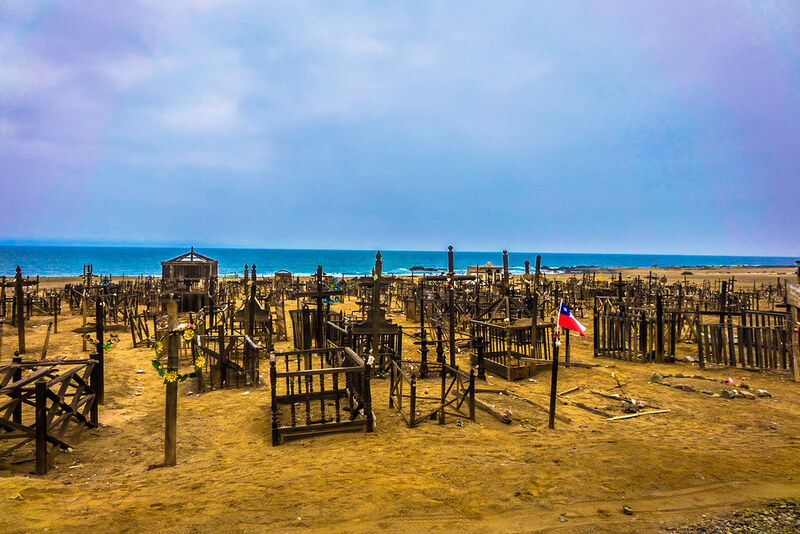 We were able to walk around Tocopilla in about an hour, and I’m certain that in the “summer” months it gets pretty busy. It had all of the trademarks of a beach community, with the boardwalk, and a million small hotels. Heck, I was probably most impressed with the supermarket, but then I’m coming to find that Chile offers up all sorts of amenities. On our final day, it was a busier day of highway traffic cycling. Fortunately the highway had a wide-shoulder, and the weather cooperated. I want to say that the cycling was unremarkable, but the sights were impressive. We passed by the Tropic of Capricorn near the airport into town, and then we passed “La Portada”, which is a really cool rocky arch (and park) a little bit closer to town. 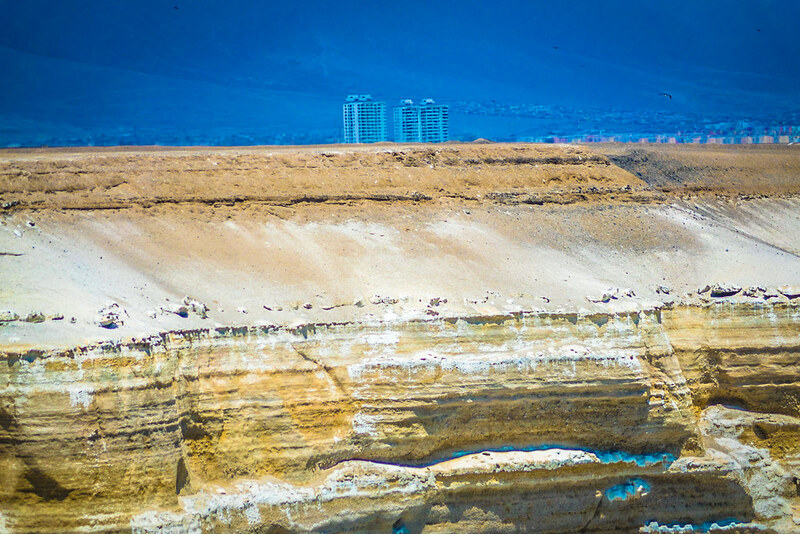 Antofagasta is Chile’s third-largest city, and getting through it took a lot longer than I thought it would. Fortunately there is a really nice bicycle path that starts near La Portada and then runs all the way through town along a beach boardwalk. Still, it’s really a sprawling metropolis…and it’s a boogie boarding mecca too apparently. We passed by a community project that takes “inner city” kids and puts them on boogie boards after school. It’s run by an ex-pro who used to compete on the world body boarding circuit. I told him I’d stop by in a few days and see what boogie-boarding was all about here in Chile. So the most dramatic part of the day was when we arrived at our hospedaje that we had booked on Booking.com. I have been having trouble understanding Chilean spanish, but basically they were overbooked, but the owner was going to come in a car, and take us to a different place. I think it was her apartment? Anyways, she showed up in her tiny car, and we knew right away that we would be cycling the 6km to the other hostel. It felt like we were getting a bait-and-switch pulled on us and we were a little uneasy about the whole thing, and even talked about just finding another place to stay entirely, but the truth of the matter is that it’s ****ing expensive in this city! So we let our wallet make our decision, and I was happy with the result. We basically ended up having a huge apartment all to ourselves. I’ll let Amanda talk about what she didn’t like about it, but I think, for what we were paying, and where it was located, that it was a great deal. Amanda writes: Andrew’s summary of the day’s is perfect and I’ve got nothing to add expect that it was great to be cycling along the coast again. The place we stayed had okay reviews and one consistent comment was the kitchen was really dirty. We knew it going in and usually use our own kitchen utensils anyway. Combined with that as we were moving to the other location I had hope that it would be better. Nope. I know why the hospedeje is dirty. Over the period we spent there I had a couple of instances in which I was contemplating leaving because of the filth, but Andrew reminded me the price was right. He also went as far as to clean some of the place for me. He cleaned the kitchen and swept the floors. We still didn’t walk around without shoes on, but we made it all work. It was a fabulous location right on the beach so in the end it was a good place to hole up before our next section. 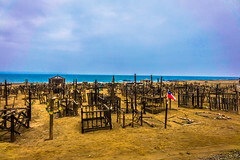 We finally reached the Chilean coast and came across a very interesting graveyard along the beach. Our beach camp spot of the night on the Chilean Pacific Coast. 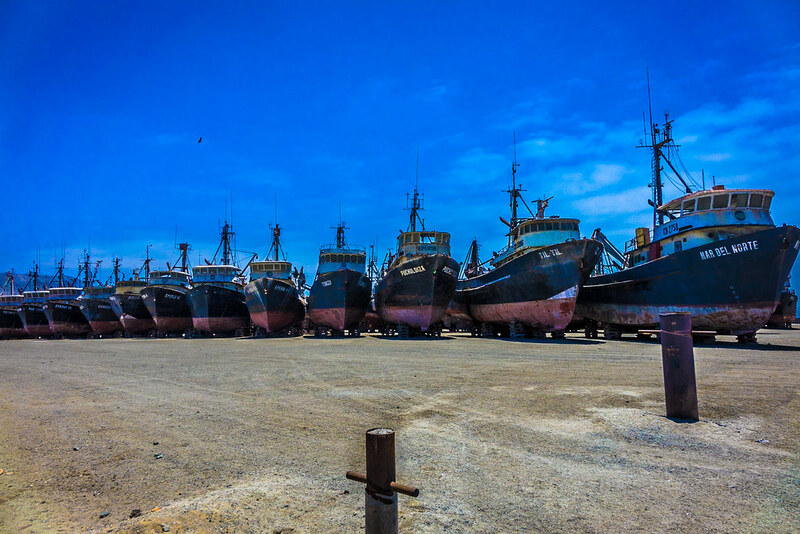 This fishing fleet was just outside Antofagasta. The famous La Portada rock structure in Northern Chile. 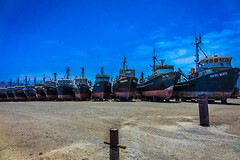 La Ported just outside Antofagasta in Northern Chile. 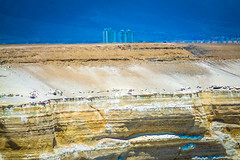 La Portada rock with Antofagasta in the background. 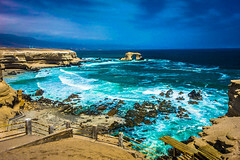 La Portada rock in Northern Chile. The Chilean coastline with Antofagasta in the background. Andrew's trusty bike with La Portada in the background. Yeaaaaah Amanda and Andrew your back on line! 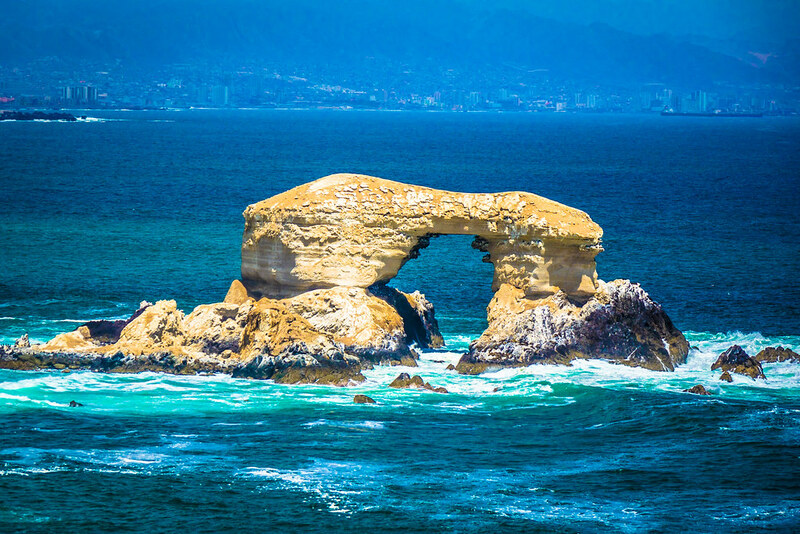 Tropic of Capricorn, La Portada Rock and the Ocean…..great hearing about those places….dirty, filthy,stinking,must clean before you cook kitchen….not so great kitchen but you made it work! Keep on with the journey loves! The Ocean looks beautiful!